Trust your silver to the experts since 1839! Goddard's Silver Polishing Cloth is made from super soft 100% English cotton impregnated with our unique formula. The 17.5" x 13" cloth is one of the largest available, lasting longer and making big jobs easy to complete. Goddard's cloth quickly cleans and shines while instantly removing light tarnish, and leaves behind a layer of anti-tarnish protection. 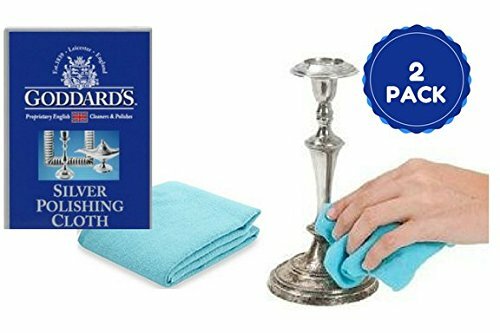 Goddard's Silver Care Cloth effectively removes tarnish from silver, silver plate, and gold. It works perfectly on antiques, decorations, and home fixtures that can't be rinsed. It also removes other kinds of decay, such as corrosion, rust, discoloration, deterioration, and time-accumulated stains. The polishing cloth not only wipes off tarnish, it leaves a protective coating on silver surfaces, a tarnish resistant barrier that defends your fixtures well into the future. The polish fights tarnish by washing off layers of oxidation, restoring the silver's natural gleam and shine and making it look as good as new. It also preserves pieces natural luster and classic beauty without damaging their finish. Wipe metal surfaces Goddard's polishing cloth to remove tarnish, then buff them until they shine. Use the cloth together with Goddard's other products, such as silver dip, silver foam. This cloth is 100% English cotton and is soft and durable. It contains Goddard's unique cleaning, polishing, and anti-tarnish agents, and the non-abrasive material adds another layer of silver care, as it won't scratch or damage surfaces when buffing.